Mary has been inspired by artists from her childhood, including her mother, who studied at Layton Art School, Milwaukee Wi. and painted watercolors. Mary's father painted detailed watercolors from wildlife stamps. Her high school teacher, Charlie Parks, was a stickler for perspective. Family friend, Joe Enterline, paints seascapes in watercolors. Other inspirational artists were Ernest H. Shepard, Andrew Wyeth, Jamie Wyeth, N.C. Wyeth, and Norman Rockwell. Mary grew up on Deer Spring Farm in the hills of Western Pennsylvania. She attended college at Indiana University of Pennsylvania as an art major. She has been painting murals, pen and inks, faux finishes and decoative arts until recently discovering her favorites, vintage cars. Her talent has definately been a gift from God. She now resides in the midwest. Her work is in several homes and business's including restaurants, hospitals, and private offices. She also has marketed her work with a company that makes tin signs sold at Hobby Lobby. The Yeadons have 20+ vintage cars on their small farm. She drives a '65 VW bus, a '60 Buick convertible , a '67 Mustang convertible,a '61 Triumph roadster and is currently helping her husband and son finish her '58 Cadillac. took it on a road trip to the Mecum Spring Auction. Barrett-Jackson Auto Auction Scottsdale, Az. Morris Annual Swap ans Car Show Morris, Il. July 3, 2016 Mahomet, Il. 2016 Barrett-Jackson Auto AuctionScottsdale, Az. 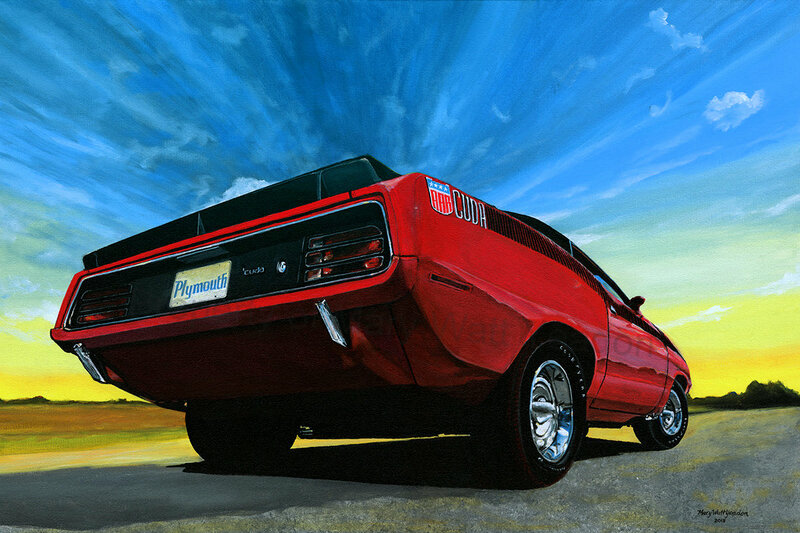 Muscle Car and Corvette Nationals-Featured Artist this year! Bloomington Gold 2012 St. Charles, Il.